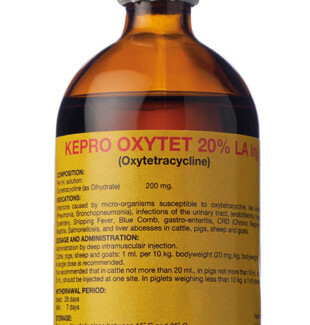 Oxytetracycline is a broad-spectrum antibiotic, with bacteriostatic action against a large number of Gram-positive and Gram-negative organisms (like Streptococci, Staphylococci, Pasteurella spp., Brucella spp., Corynebacteria spp., Erysipelothrix, Coliforms, Salmonella), Rickettsiae, Mycoplasmas, Chlamydia and some protozoa. Activity against Pseudomonas, Proteus- and Klebsiella spp. is low. Oxytet 20% LA Inj. 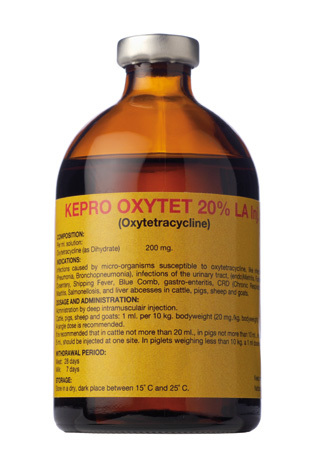 is effective against infections caused by micro-organisms susceptible to oxytetracycline, like infections of the respiratory tract (pneumonia, bronchopneumonia), infections of the urinary tract, foot rot and Bedsoniasis in sheep. Do not administer to animals hypersensitive to tetracyclines. Do not administer to animals with a severe impaired kidney or liver function. Do not administer to horses, dogs and cats. Do not administer to ewes producing milk for human consumption. due to its long action of at least 3 days.